My friend Kayse and I were chatting about our ordinary lives recently and she commented that it sounded like a full week in a good way. My life feels full right now. But I’m learning full is different and healthier than busy. We have some boundaries on our lives. The kids are allowed one extracurricular activity at a time. We make every effort to eat dinner together, even if that’s at Subway after soccer practice. We just got back from a fun visit to Louisville, where we hung out with my mom, my brother and his family, and my dear friend of almost 25 years Katie and her boys. We had an impromptu visit with a high school friend and his wife who were in town and joined us just in time for Kentucky’s Final Four game. We’re going camping with our best friends this weekend. We are fundraising for a Guatemala trip, planning birthday parties because three of the four of us have birthdays within two weeks from late April to early May, engaging with local ministry opportunities, and making time to be with family and help friends. These things fill our calendars but I’m not letting any of them go right now. I believe in everything we’re doing right now. And I believe we’re supposed to be doing it. Trips are temporary but worth the journey. Our birthday celebrations will be over before school is out for the summer, but these are part of the memories of our lives. We come home from Guatemala on July 11, but I know we’ll have a new perspective. With the fullness comes unique opportunities to see God working – especially in my recovering perfectionist self. Within the fullness, I’ve been able to find some stillness. Recently I told my friend Jen sometimes rest comes in chunks of time following a packed day. Right now, Mondays and Wednesdays tend to be fuller than Thursdays. The summer is bound to look different. And then in August both my kids will be in school full time. I know I need the time to take deep breathes, do laundry, and regroup my soul, so I clear out time for that. Some evenings I need to clean off the kitchen table before I sit down on the couch because it keeps me from being stressed out. But sometimes the dishes sit next to the sink for a day or two. That’s the beauty of seasons. Remembering that helps me embrace my full life right now. Kristin, it is so true that seasons bring change & not every season is busy. 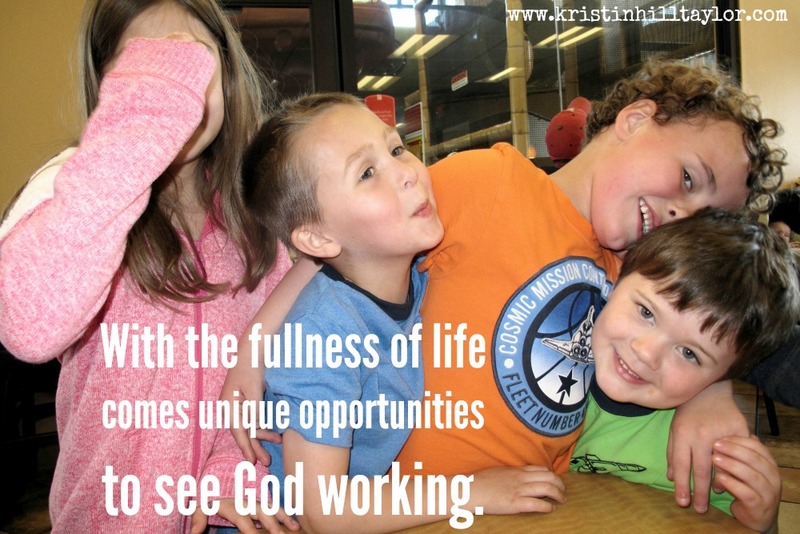 And this here is the point>> "With the fullness comes unique opportunities to see God working." May we have eyes to see the unique opportunities God puts in front of us. So grateful to have been here this morning! I can so relate here, my friend. I'm unfortunately feeling more busy than full lately. Thank you for opening my eyes to what is probably my problem, following my schedule instead of God's. You have a lot of spring birthdays! Ours are pretty spread out through the year. I hope you enjoy each celebration :). Thanks for this today! I love how you relate to life being "full" these days. I have been using that term a lot recently. Because life if full. The word is so much more appropriate than busy. It's full of good things the Lord is asking us to do. It's full of some hard things too but God is with us and teaching us through those things. Like Joanne highlighted, "With the fullness comes unique opportunities to see God working." And He is always working!! So blessed by you, friend. So grateful you are part of my life. Yes, I've been praying for those eyes too, Joanne. So glad you're here today! Yeah, the birthday season is a bit crazy but fun! I hope you find some margin in your calendar – I know that always helps me. I'm so glad you're here, Candace! Oh girl– right when I saw your title, I knew it was going to speak to me. And it did. The last couple of weeks have been a bit wonky– not "busy" with my typical tasks, but rather full with a reunion with my Beloved husband via army things. And now, this week, I realize how "behind" I am with tasks– but laying many of them down, knowing that the fullness of our family time is so-much-more fruitful than a busy to do list. It's amazing to find the balance – which I think is where that full feeling. It's kind of like food – you are satisfied but not stuffed. Healthy but not anemic or over-gourged. Love you, friend! And I am hoping for a face to face, too. Have you thought about Speak UP? Yes, I get the food analogy, for sure! I have thought about Speak Up but it's not at a good time for me, at least not this year. We're going on a mission trip to Guatemala earlier in July and then to St. Louis with friends that same weekend of the conference. I'd love to go sometime, though! Love you, Jen! Um, some days I do, Susan, and some days are hard. But that's part of it, I suppose. God's certainly doing a work in my life. Thanks for being here. So glad, Sharita! Yes, keep laying those tasks down for what matters. It's hard some days but definitely worth it. I'm glad you're here today and appreciate your encouragement. I could almost hear the sigh at the end of this post – you have such great perspective on balance here. I'm on the busy end of fullness right now, but there is light at the end of the tunnel and I'm craving it. Your words resonated with me – sometimes we've got to clean before we rest (so the Type A stops screaming) and other times we let things go. I think there is grace in that and God moves when we choose wisely. Thanks for sharing your fullness! Yes, a sigh certainly came with this realization. I'm still learning about balance, but God's brought me a long way from where I used to be, thankfully. And I totally know about that Type A screaming … all too well. 🙂 Thanks for your comment here that is packed with encouragement for me. I love getting to know you. I smile each time I visit you. It feels like a snapshot into your life, a glmpse of Kristin that you are willing to share. In His grace we get to come to these realizationg about the good and the perfected in our selves and learning to choose His way over our own, trusting that he meets us. When we do that, even when we are FULL…even when we ARE busy… there is a deep abiding peace. Sometimes I question, even whine, about why I have to bend yet one more time, but every single time i do, EVERY TIME we let ourselves walk through the doors HE opens and thank Him for the doors He shuts, it is good. Blessings and thanks for faithfully hosting a place of grace to meet others on the journey! Praise God when He fills our cup to overflowing! His strength is made perfect in our weakness, and he will see us through whatever He has assigned to us! Thanks for hosting & God bless! And, really, I find myself needing both stillness and fullness. You're right, they can happen in a moment's notice. Thanks for being here, Laura! Yes, Laurie! Amen! Thanks for being here.